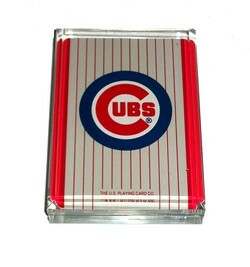 Very nice paperweight featuring the Chicago Cubs encased in crystal clear acrylic. It has the look and feel of real glass. This regal looking item is sure to jazz up any desk, table, counter, dresser, vanity or work bench. The paperweight weighs about 10 ounces. It is 3 3/4 inches by 2 3/4 inches and almost a full inch thick. It comes is a plain white gift box.